“Super Tonio” Is A Super Big Baby! Antonio Vasconcelos weighs 14.5 pounds and drinks 5 ounces of milk every three hours. But here’s the catch…Antonio is a newborn – a newborn human. Born this past Monday in Cancun, Mexico to parents Teresa Alejandra Cruz, 23, and Luis Vasconcelos, 38, “Super Tonio” was born by Cesarean section (thank goodness! ), and is 22 inches long. Residents of the resort city have swarmed the maternity ward’s window for a chance to see the newborn sensation. Super Tonio’s parents are proud of their new edition and add that seven years ago Cruz gave birth to a baby girl who weighed in at 11.46 pounds at birth. Man! Those are some big babies! 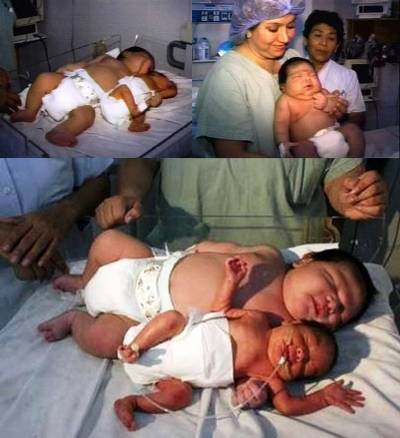 A baby weighing 16 pounds, 11 ounces was born in Salvador, Brazil in January 2005. The heaviest baby born to a healthy mother, according to Guinness World Records, was born in Aversa, Italy in September 1955 and weighed a whopping 22 pounds, 8 ounces. My uterus hurts just thinking about it! previous post: Michael Jackson’s Kids — Unmasked!! next post: Punxsutawney Phil Didn’t See His Shadow! THAT BABY IS SO HUGE THE WOMAN MUST OF DIED GIVING BIRTH TO THAT I FEEL SORRY FOR THE WOMEN I HAD A BABY WEIGING ONLY 1POUND AND DIED 2 HOURS AFTER IT WAS BORN IT WAS HARD HAVING HER BUT HIM HER INSIDES MUST BE WRECKED!!!!!!!!!!!!!!!!!!!!!!!!!!!!!!! Wow!! I agree!! Very beautiful baby. I too gave birth by caesar to a big baby boy at the end of July. Michael was born weighing 12lb 4oz and was/is a very healthy baby. Carring such a large bub is tiring but well worth it. Just think of those mums carrying twins or more???!!! WOW i had a baby boy 2 years ago now and i thought he was big he weighed 9lb 15oz not that big i guess but im only a little person myself. That baby looks so much bigger than my 2 yr old….That poor mom must still be in a lot of pain… I had 2 babies at 5lbs 8oz & 3lbs 3oz..and that hurt me a lot…But overall the baby is sooo adorable…All babies are right? That is amazing baby. The mother must have a lot of sacrifice with this baby. Yet it’s compensating seeing your baby as big as this. 51 queries in 0.711 seconds.